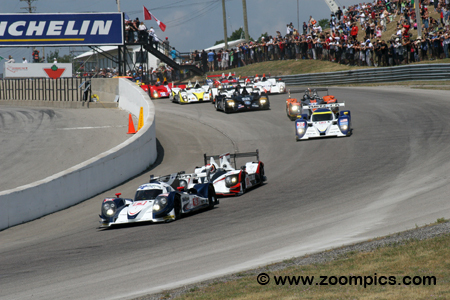 Canadian Tire Motorsport Park hosted the fifth round of the 2012 American Le Mans Series. Twenty-six starters would compete in a two-hour and forty-five-minute contest around the 2.459-mile ten-turn road course. The second fastest qualifier, Chris Dyson driving the Mazda-powered Lola B12/60 took the lead going into corner one on the first lap. Immediately behind Dyson is the pole-winning HPD ARX-03b of Muscle Milk Pickett Racing which was piloted by Klaus Graf and Lucas Luhr. In third is the second Dyson entry, a Lola B11/66 shared by Eric Lux and local driver, Tony Burgess. It was back to business for the Muscle Milk team. They were outgunned in qualifying at Lime Rock Park by Dyson Racing but were back at the top of the timesheets in round five. Klaus Graf earned his third pole position on the season. During the race, there was drama (too many crew members over the wall which resulted in a penalty) for Graf and his co-driver Lucas Luhr but that was of little consequence as they won for the fourth time this year. After struggling early in the season, the P2 Morgan of Conquest Endurance was finally on form. 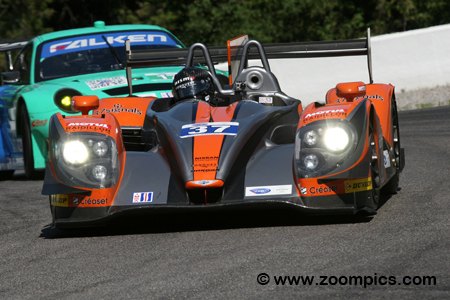 Martin Plowman qualified the Morgan and was 0.567-seconds quicker than the Level 5 HPR ARX-03b. He would share the Morgan with David Heinemeier Hanson. 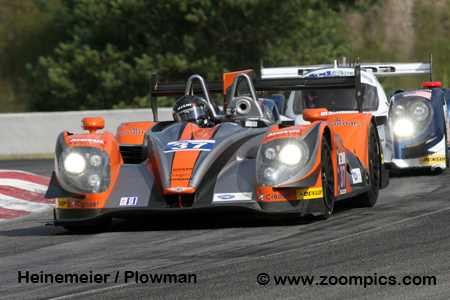 Late in the race, Plowman was battling for the win with Christophe Bouchut but a penalty took Bouchut out of contention. Plowman and Heinemeier Hanson claimed their first victory. Starting second in the GTC category was The Racer’s Group No. 66 Porsche 911 GT3 Cup which was victorious in round three at Mazda Raceway Laguna Seca. 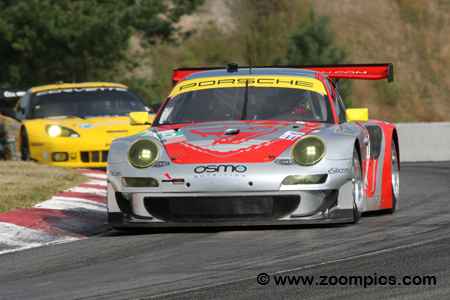 However, at Canadian Tire Motorsport Park the Porsche would be guided by a slightly different driver line-up, Emilio Di Guida returned and was joined by Spencer Pumpelly. The pairing worked as Kevin Buckler’s team won for a second time this season. The No. 01 Extreme Speed Motorsports Ferrari F458 Italia was gridded fifteenth overall and fourth in the GT category for the start of the race. Driving the entry were Scott Sharp and Johannes van Overbeek. As the race drew to an end, van Overbeek chased the leaders, Jorg Bergmeister and Jan Magnussen. He passed Magnussen which became the winning move when Bergmeister’s Porsche was disqualified. The Flying Lizards Motorsports Porsche 911 GT3 RSR was the quickest GT entry in Friday’s practice sessions thanks to Jorg Bergmeister. 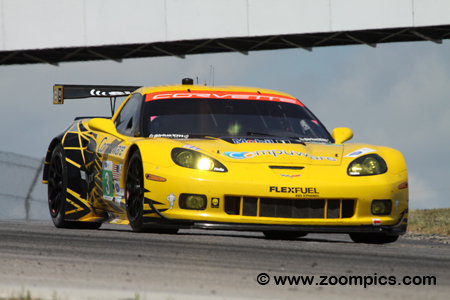 But that changed in qualifying when the Corvettes found additional speed. Bergmeister and his co-driver, Patrick Long started fifth in class. The pair found their way to the front of the class and were leading at the checkered flag. Unfortunately, their Porsche failed the ‘stall test’ and they were disqualified. 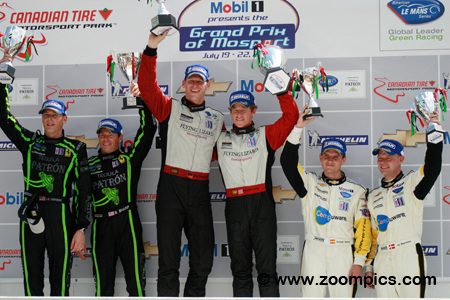 The Prototype 1 podium at Canadian Tire Motorsport Park for round five of the 2012 American Le Mans Series. In the center are the winners, Klaus Graf and Lucas Luhr. 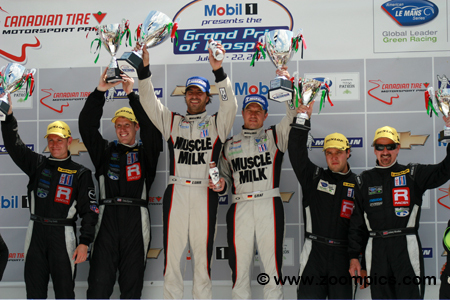 This was the fourth consecutive victory for the Muscle Milk Pickett Racing team. 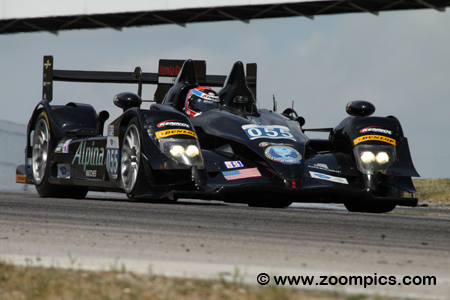 To their right are the runner-ups from Dyson Racing, Guy Smith and Chris Dyson. Completing the podium are the third-place finishers also from Dyson Racing, Tony Burgess and Eric Lux. The RSR Racing team found themselves in unfamiliar territory after qualifying. Tomy Drissi and his teammate, Bruno Junqueira would not be starting on the front row as they were third quickest during qualifying. However, a series of fortuitous circumstances allowed Drissi and Junqueira to win their first event. They gained two positions when Alex Popow was penalized and Kyle Marcelli crashed. The quickest GT competitor in qualifying was Corvette driver Jan Magnussen. Sharing the car with the pole-sitter was Antonio Garcia. As the race came to a conclusion, Magnussen was chasing the leader Bergmeister and, he attempted a pass which caused him to give up second to Johannes van Overbeek. With the disqualification of the Bergmeister’s Porsche, the loss of a position meant the difference between first and second. 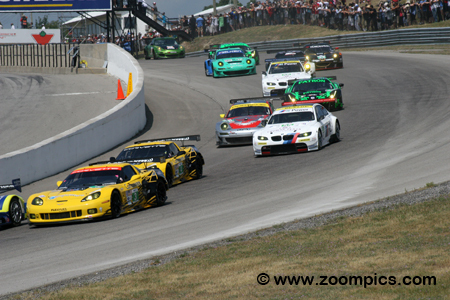 Leading the Grand Touring category through Canadian Tire Motorsport Park’s first turn are the Corvette teammates. Edging ahead is the pole-winning No. 3 entry which was being shared by Jan Magnussen and Antonio Garcia. Moving to the inside is the Chevrolet Corvette C6 ZR1 of Tommy Milner and Oliver Gavin. Following this pair is the Jorg Muller/Bill Auberlen BMW and the Porsche of Patrick Long and Bergmeister. 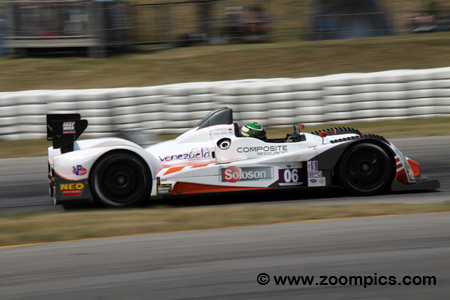 The CORE Autosports team qualified first and second in the Prototype Challenge category. Leading the charge was Colin Braun who established a new lap record. Sharing the No. 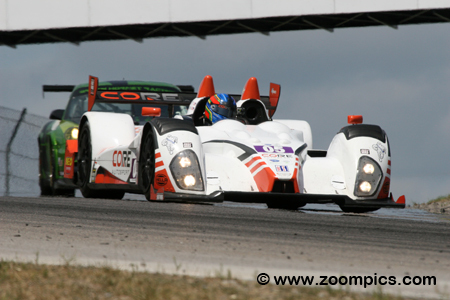 05 ORECA LMP09 with Braun was the team principal, Jonathan Bennett. During the race, the pair fell out of the top spot but a series of miscues by their competitors allowed them to claim a runner-up finish. Another team hitting their stride after disappointing results earlier in the season was the Dyson Lola B12/60 driven by Chris Dyson and Guy Smith. 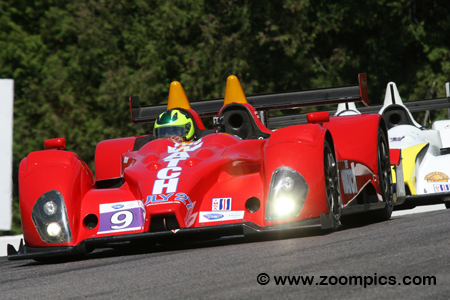 At Lime Rock Park, Smith put the Lola on the overall and P1 pole. However, qualifying at Canadian Tire Motorsport Park returned to the familiar scenario – Dyson was 2.151-seconds slower than Klaus Graf. During the race, the crew made improvements but the end result was a second place. 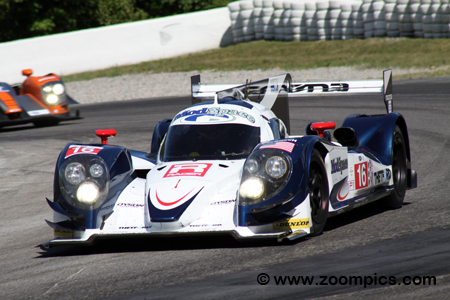 The Level 5 team has dominated the P2 category in 2012, they entered the Canadian Tire Motorsport Park with four consecutive victories. Earlier in the season, the team entered two HPD ARX-03bs but this weekend the second Honda was withdrawn. The No. 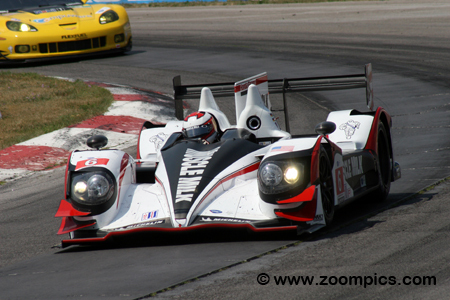 055 started second in class and was shared by team principal, Scott Tucker and Christophe Bouchut. Bouchut received a penalty late in the race which resulted in a second place finish. Cooper McNeil entered the Canadian Tire Motorsport Park round with a slight lead in the GTC standings. This weekend McNeil was sharing the No. 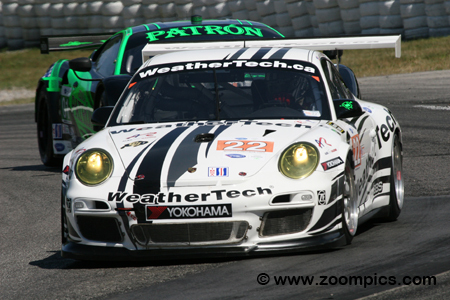 22 WeatherTech sponsored Porsche 911 GT3 Cup with Leh Keen. This pairing won the previous round at Lime Rock Park. The duo started third in their category and twenty-fifth overall. They inherited a runner-up finish when the class-leading JDX Racing Porsche retired. The Prototype Challenge point’s leader, Alex Popow was joined by Ryan Dalziel for the Canadian Tire Motorsport Park event. Dalziel qualified the CORE Autosports ORECA FLM09 and was second - just 0.237-seconds slower than his teammate, Colin Braun. During the race, Popow was at the wheel when he was involved in an incident that resulted in a two-minute penalty. The duo still managed a third in class. 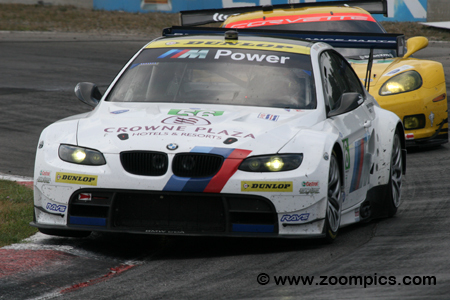 The BMW Team RLL BMW M3 of Joey Hand and Dirk Muller qualified mid-pack in the Grand Touring category. This duo along with Jonathan Summerton won the opening round at Sebring and had a second place finish at Long Beach. In the race, they did not have the speed of the front runners and by the end of the event, they were a lap behind the leaders. 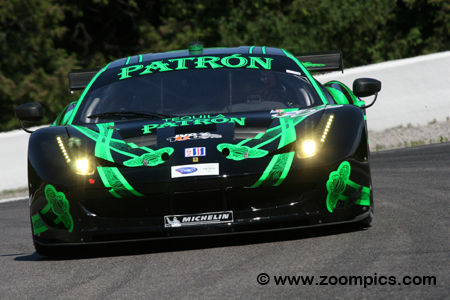 However, the pair inherited third when the Flying Lizard entry was disqualified. This image would have been entirely different if the GT podium celebrations took place after the post-race technical inspections. 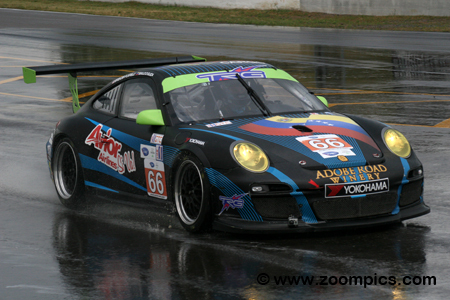 First across the finish line in the Grand Touring category was the Flying Lizards Motorsports Porsche 911 GT3 RSR driven by Patrick Long and Jorg Bergmeister. Long and Bergmeister standing on top of the podium would be disqualified after their Porsche failed the ‘stall test’.